FOMC minutes due out this afternoon: NR7 in the SPs burt Rus had climatic range expansion day. Three pushes up on 120 minute osc suggest retrace to 120 minute EMA. Indexes will gap down tho, and sometimes morning weakness in an uptrend is a tough play. Bonds and Tens: Watch yield charts – potential for inverted head and shoulders to form if higher low is made – see chart below. Crude took out upside pivot on the weekly charts – looking for trade back up to 108 – 110. AD6 bars price overlap – breakout mode. Yen had news based flush but did not give up much ground – on pinball buy. GC and SI – Price equals time consolidation due – easily seen on 240/480 minute time frames. Liquidation breaks in CL GC SI, grains, sugar, coffee, all set up buying opportunities. 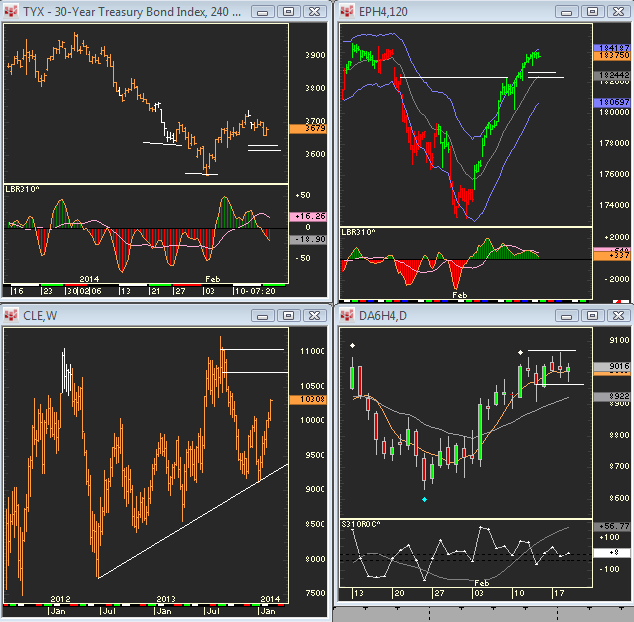 SP levels: 1829 = 5 SMA, 1827 , then 120 minute pit session EMA comes in 1823.5. To upside: 1837. 1831.50 was area of two day lows. NR7 can lead to trend day. Will SPs open below PDLow? market may go quiet an hour before FOMC minutes are due out.